Click on the above image to view San Juan’s Digital Brochure. In today’s busy hectic world, families are increasingly seeking a place to relax, away from the hustle and bustle of every day life. More than ever, that place is a relaxing oasis only a backyard pool can offer; a place to exercise, entertain family and friends, a quiet moment alone, unwind from a long days work, and a safe wholesome haven for the children. With such a premium on everyone’s time and resources a pool must also be easy to maintain, energy efficient, durable, and offer a good overall value. 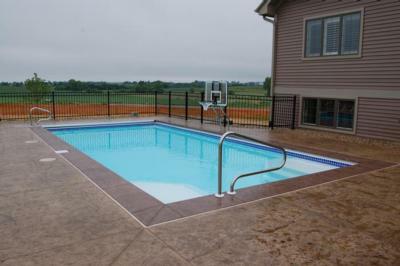 No other swimming pool is more perfectly designed to fill these needs than a fiberglass pool. Never needs resurfacing, (new liner, acid washing, re-plastering, painting). Has a non porous interior that doesn’t provide a breading ground for bacteria and algae, (unlike a rough plaster finish or seams in a vinyl liner). No more skinned bleeding toes and knees or frayed bathing suits. Totally non-corrosive construction that will never rust or pit. Lower heating costs, fiberglass in pools as in your home acts like an insulator. Fungus will not grow through the interior finish like it can with vinyl liners. No punctures or tears like a vinyl liner. A quote from Money Magazine sums up fiberglass pools best when it stated, “Fiberglass pools are the easiest to maintain. The smooth finish and rounded corners don’t chip, tear or harbor bacteria and algae”. 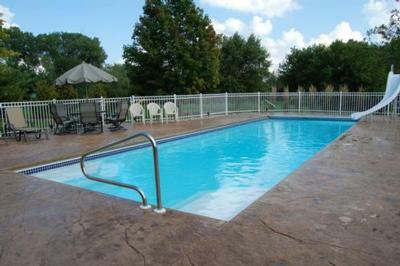 The finest fiberglass pool money can buy is the one Capitol Pools offers, an original San Juan Fiberglass Pool. 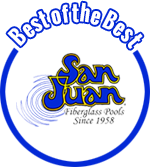 San Juan has been the industry leader since 1958, setting the standard for fiberglass pool technology and product development. San Juan was the first manufacturer of inground fiberglass pools in the United States and has nearly 100,000 pools/spas installed throughout the U. S. and Canada. San Juan offers over 90 pool and spa models to choose from, each designed specifically to meet it’s perspective owners needs. Only the highest quality materials are used in a controlled manufacturing environment assuring every pool produced is of uniformly high quality. San Juan still builds pools by hand laying fiberglass, (chopped fiberglass is not used), one pool at a time. Every San Juan pool is backed by the incredible 25 year non-prorated warranty on the structural integrity of the shell. The pool itself is the foundation for the entire pool yard experience as you may choose to add one or more of a variety of pool amenities such as; decorative ceramic waterline tile; choose from the many decking options; built in hot tubs; waterfalls; planters; automatic cleaners, controls, or covers; pool lighting; diving boards; slides; heating systems; the list goes on. If you can dream it we can build it. From a modest backyard pool to the most exquisite entertainment area, Capitol Pools will design and construct your dream with unwavering care to detail and dedication to complete customer satisfaction. 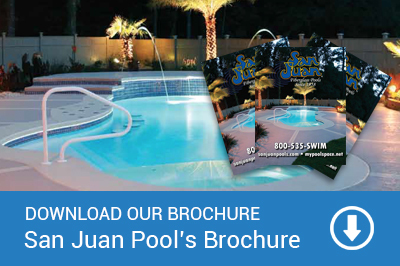 Click HERE for more information about San Juan Pools, sizes and shapes, etc. If you would like more information or to set up a free at home consultation and quote without obligation. Please contact us or call 608-837-7665.